Crystal Clear Shine is your premier source for all exterior washing needs in Wrightsville Beach. We can remove stubborns stains from your siding, shine up your driveway, and additionally, we can make your roof look brand new! Our roof cleaning methods are safe and effective for all types of roofing materials including: Asphalt shingles, Metal, Tile, and Slate- We are certified to wash it all! At Crystal Clear Shine our knowledgable employees will wash your roof with zero risk of damaging your property that frequently occurs with older, outdated high-pressure methods. Our no-pressure roof cleaning method is manufacturer approved and will not void your roof’s warranty. We use specialized cleansers to break-up and dissolve ugly algae, mold and mildew. We rinse it all away using a safe and effective no-pressure water rinse. This method reveals a clean, like new roof for a fraction of the price of a roof replacement. Call Now For a Free Estime! 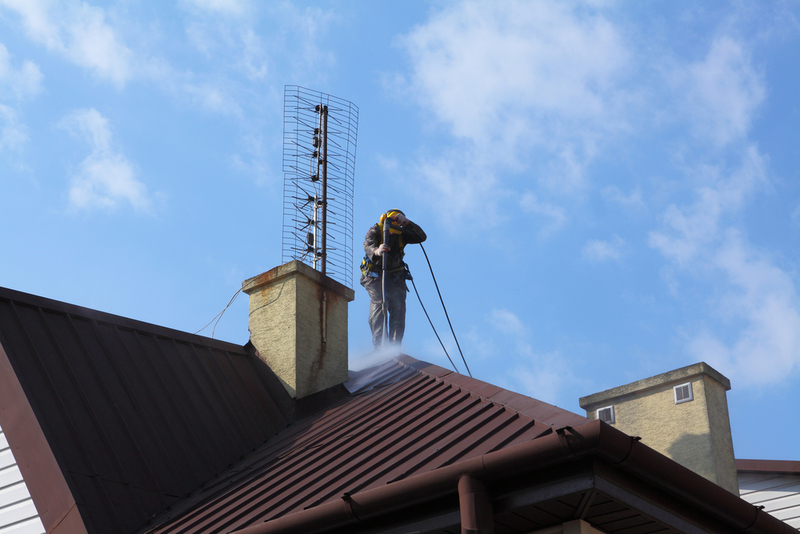 Generally, it is a good idea to get your roof cleaned by professionals once a year. This is often enough to where if problems do start to develop, they can be caught early on, by a skilled professional. We will keep you highly informed of anything we notice and potential threats we find that could cause damage to your roof in the future. Mold, Algae, and Debris love to make our roof their new home. You may begin to notice mold covering your roof or black streaks running up and down your shingles. These are major signs that you need to get your roof washed and remove those potentially damaging organisms right away. By allowing fungi and mildew to reside, you will be aging your shingles lifespan dramatically. Therefore, when you clean your roof regularly you will notice a difference in its appearance instantly, and be protecting your investment for the years to come! Simply, The main reason why you need your roof cleaned often is that it makes it look better. It increases its curb appeal and if you are in the market to sell- it will help attract potential homebuyers. Aside from that, a regular maintenance cleaning is also good for removing debris such as tree branches that could cause serious damage if left on your shingles. It also is an opportunity for a trained expert to inspect your roof for signs of damage, holes, missing shingles and other issues that can be discovered, so you can take care of those problems before they get out of hand. Unless you are skilled in cleaning roofs yourself, you want to leave this job to the professionals. One reason is that this can be hazardous work. There is always the potential to slip and fall. Expert cleaners know what precautions to take. Additionally, professionals will use the best cleaning materials out there that will adequately clean your roof without damaging any of the materials. We know the industries top techniques and have the best solutions to completely remove mold and fungi from your roof. Residential, commercial, or industrial we are your guys. At Crystal Clear Shine we are always upfront and honest about the work that we do. Therefore, if you have a leaky roof and it only needs to be patched we will tell you. If your roof doesn’t need more work than is necessary then we will tell you. Our expert roof cleaners always lookout for these details for our customers to ensure your money isn’t wasted and the root problem is fixed. Our goal is always 100% customer satisfaction. Contact our team today schedule your next roof cleaning appointment! Roof cleaners showed up on time and were very respectful of our landscaping. They did a really great job cleaning mold and mildew from our roof. I recommend this company. Wow! This company does the best soft washing in town!! They have done such a great job with cleaning our roof, we can't recommend them enough! My neighbor recommended crystal clear shine to us, and we could not be happier with the services provided. They cleaned our windows, patio, and our roof- and did an excellent job! 5 star roof cleaning services!!! We highly recommend Crystal Clear Shine and all their pressure cleaning services. We just had our roof cleaned for the 2nd time, and they did an incredible job. This company did an amazing job removing the stubborn streaks on my roof. They made my home look clean and my roof brand new. Thank YOU! Great Roof Cleaners! They were prompt, prepared, and did an excellent job removing the dirt off our roof.